Most travelers take some cash with them to Peru, in the form of dollars, Peruvian neuvos soles, or both. But if you’re traveling in Peru for more than a few days, at some point you’ll probably want to withdraw money from an ATM (automatic teller machine/cash machine). Withdrawing money from an ATM is the most common way for travelers to access their funds while in Peru. It’s also one of the simplest methods, with ATMs found in every city. You’ll find plenty of ATMs in every major city in Peru, and at least a couple in every midsize town. Standalone ATMs are often found near the city center, typically on or near the city’s Plaza de Armas (main square). Alternatively, look for an actual bank, most of which have ATMs inside (see safety below). 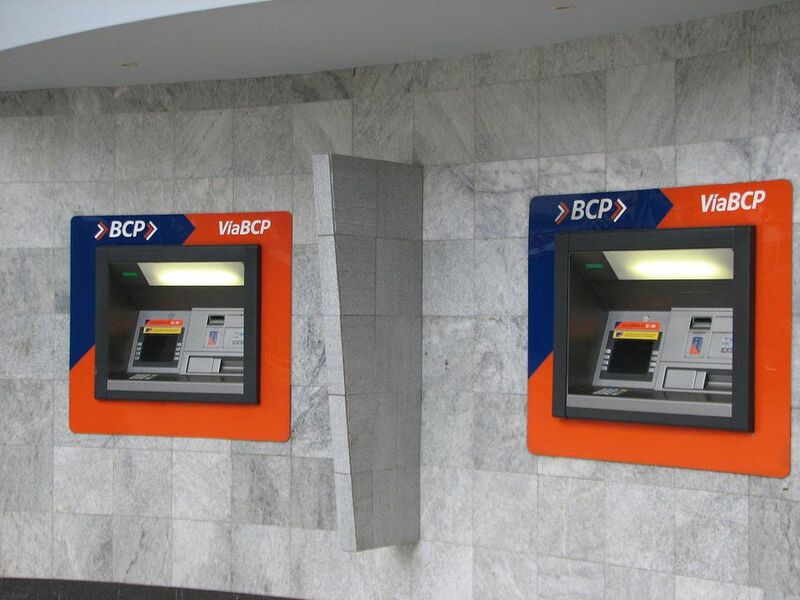 You’ll also find ATMs in some Peruvian airports and occasionally in pharmacies and shopping centers. Some of these ATMs might have higher than average usage fees (see fees below). Small towns and especially villages are unlikely to have ATMs, so take some cash with you. Take nuevos soles in small denominations as many businesses won't have change for larger notes. As a side note, Peruvian ATMs typically give you two language options: Spanish and English. If you don’t speak the local lingo, choose English/Inglés when you see the Language/Idioma option. Visa is the most widely accepted card (tarjeta) in Peru, and nearly all ATMs accept Visa for cash withdrawals. You’ll also find some ATMs that accept Cirrus/MasterCard, but Visa is the most common. Before you go to Peru, always ask your bank about using your credit and debit cards abroad. Sometimes you’ll need to clear your card for use in Peru. Even if you do clear your card, or if your bank assures you it will work just fine in Peru, don’t be surprised if it’s suddenly blocked at some point. If an ATM won’t let you withdraw any money, it might be out of order or out of cash (or you entered your four-digit PIN incorrectly). In this case, try another ATM. If no ATMs will give you cash, don’t panic. The local network could be down, or your card might be blocked. Go to the nearest locutorio (call center) and call your bank; if your card has been blocked for whatever reason, you can normally get it unblocked within minutes. If an ATM swallows your card, you’ll need to contact the bank connected with the ATM. Getting your card back can be a lengthy process, but be polite, put on your best “I’m sad and helpless” face and you’ll get it back eventually. Most ATMs in Peru do not charge you a transaction fee -- but your bank back home probably does. This charge is often between $5 and $10 for every withdrawal (sometimes more). There might also be an additional 1 to 3 percent transaction fee on all credit and debit card withdrawals abroad. You should ask your bank about ATM fees in Peru before you travel. GlobalNet ATMs do charge a withdrawal fee. You’ll find these ATMs in Lima airport; if you need to withdraw cash on arrival, avoid GlobalNet and look for another option with lower/no fees (you’ll find a few alternatives inside the airport). All Peruvian ATMs have a maximum withdrawal limit. This can be as low as S/.400 ($130), but S/.700 ($225) is more common. Your bank might also have a daily maximum withdrawal limit in place, so ask before you travel. Most ATMs in Peru dispense nuevos soles and dollars. In general, withdrawing nuevos soles makes sense. But if you’re about to leave Peru for another country, it might be wise to withdraw dollars. The safest place to withdraw money from an ATM is inside the bank itself. Many banks contain at least one ATM. If you need to withdraw cash from an ATM in the street, avoid doing so at night or in a secluded area. A well-lit ATM in a reasonably busy (but not too crowded) street is a good option. Be aware of your surroundings before, during, and immediately after withdrawing money. If you are worried about withdrawing money from an ATM, ask a friend to go with you. If you notice anything odd about an ATM, such as signs of tampering or anything "stuck on" (like a false front), avoid using the machine.